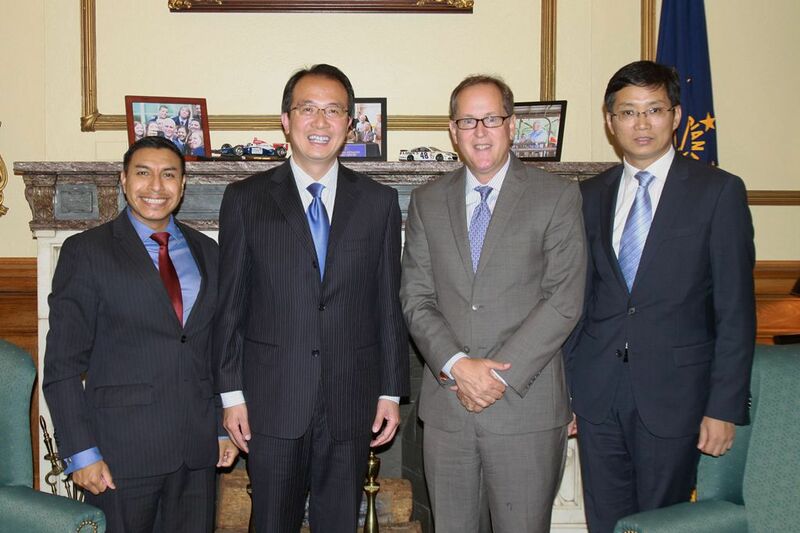 On August 31 , Consul General Hong Lei visited the State of Indiana and met with Governor Mike Pence’s Chief of Staff Jim Atterholt and Special Assistant Diego Morales in Indianapolis, the State Capital. Consul General Hong Lei said that in recent years, exchanges and cooperation between China and Indiana have been deepening. In 2015, bilateral trade volume reached $9.6 billion, a 5% increase over 2014. Chinese companies have invested nearly $300 million in Indiana, creating more than 800 jobs. More than 10,000 Chinese students are studying in Indiana universities, accounting for 40% of international students in the State. Sister province/state relations between China’s Zhejiang Province and Indiana have enjoyed sound development and remarkable results. The Consulate General would like to work with Indiana State Government to promote China-Indiana cooperation in broader areas. Mr. Atterholt said that Governor Pence paid a successful visit to China last year and was warmly received by the Chinese side. Indiana enjoys advantageous location,economic diversity, strong competitiveness in agriculture and manufacturing and good investment environment. The State Government attaches great importance to friendly cooperation with China and welcomes more Chinese enterprises, students and tourists to Indiana.